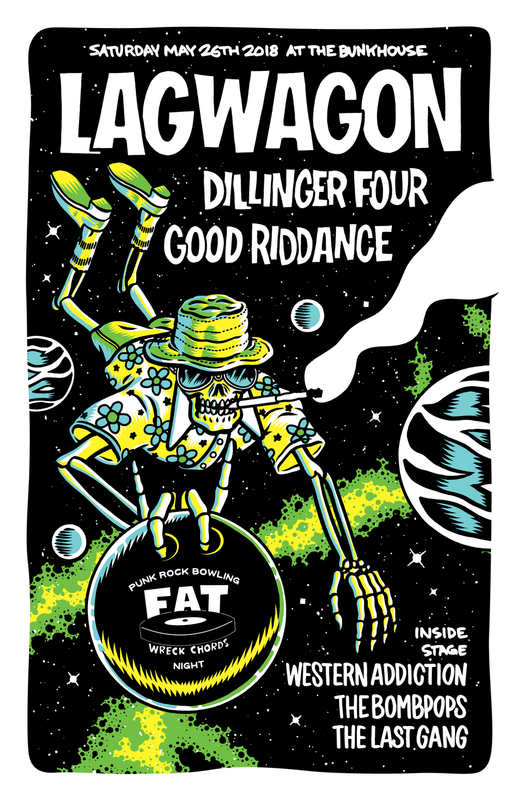 FAT WRECK CHORDS, Poster Art & 10" Vinyl Packaging. In March of 2018, I had the pleasure of creating the visuals to accompany FAT Wreck Chords' showcase and compilation vinyl record packaging. Considering the amount of FAT Wreck Comps I've owned over the years (all of them) and the countless records from FAT Wreck bands I've owned or countless shows by FAT Wreck bands I've attended over the years (many many years), I felt an obligation to really come up with something fun and cool, that walked right up to the line of being cheesy, but that peeked over instead of stepped, or tripped into the pitfalls that the client expressed the need to avoid.